A few years ago, Willow Dunaway returned to her hometown, Darling, Vermont, and opened The Purple Pig, a café that specializes in healthy delicious dishes made from local organic, and fair trade ingredients. The serene Willow, practitioner of yoga and meditation, whose appearance suggests she is a nouveau hippie, is quite different from the up-tight, high-achiever Willow was in high school. Because her best friend, Laurel Stone, recently married Aiden Gallagher (Somebody Like You), Willow is drawn into the circle of the exuberant Gallagher family. She and Hannah Gallagher become close friends, and Willow is warmly welcomed by the entire clan--except for the eldest son Ethan. Willow and Ethan shared an awkward moment at Laurel and Aiden’s wedding when she caught the bridal bouquet and he caught the garter. Unlike the rest of his family, Ethan seems cold and judgmental. Ethan Gallagher, a widower with two young sons, Connor and Ronan, was not always a grump, but he is still grieving the loss of his wife Lisa eighteen months earlier. He is also burdened by his responsibilities as the boys’ sole parent and by the guilt he feels that his 24/7 shifts as a firefighter necessitate his depending on his family to help care for his sons. The somber Ethan writes Willow off as an idiosyncratic lightweight, but his sons fall for her free-spirited charm. As Willow and Ethan are thrown into each other’s company, they are forced to acknowledge the chemistry between them, but neither is looking for a relationship. Ethan, still holding on tightly to his past with Lisa, has not yet come to terms with his loss, and Willow has a dark past that includes an indifferent mother, an eating disorder, depression, and a failed romance. Her focus is on maintaining the peace she has found through her new lifestyle. But as their initial impressions of each other are corrected, the attraction moves beyond the merely physical. Ethan is drawn to Willow’s whimsicality, generosity, and love for his sons, and she finds his sense of responsibility and surprising sense of humor immensely appealing. But unexpected consequences jeopardize their developing relationship. Broken hearts appear more likely than an HEA. 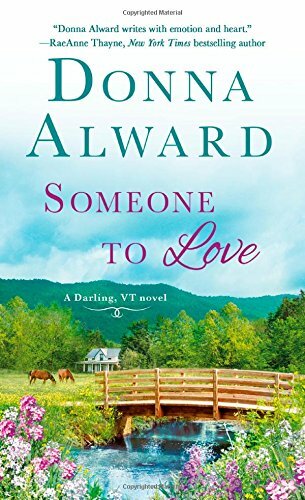 Alward’s second Darling, VT novel is even better than the first. Willow and Ethan are both wounded characters who win readers’ hearts, although Willow’s wounds are more deeply hidden than are Ethan’s. The anguish and loss these two have suffered is real rather than a growing pain sometimes exaggerated to trauma as is sometimes the case in contemporary romance. Connor and Ronan are adorable, but they are also believable kids who can be rambunctious, competitive, and whiny when tired. They are more than generic cute kids. They are sweet and vulnerable and sadly in need of a mother figure, a role Willow falls into easily, and there is never any doubt that Willow’s relationship with Ethan includes Connor and Ronan as well. Fans of the first book will be pleased to see more of Laurel and Aiden. The Gallagher family is fast becoming one of my favorites. I enjoyed them all. Kudos to Alward for dealing with birth control with a rare degree of realism and in a way that adds to the story’s strength rather than detracting from the romance. 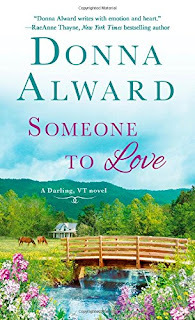 If you like your romance with a delightful small-town setting, a cast of likeable characters, and an unusual blend of grittiness and heartwarming appeal. I highly recommend Someone to Love. You will also want to put the third book, Somebody’s Baby, an April 4 release, on your list. THIS SERIES DEFINITELY ON MY WISHLIST. I'm picking up the first one tomorrow at the library. I love the small-town romances. Great review! Will add to my wish list. I look forward to reading this series. Haven't read this one yet, I liked her other books.. I discovered Donna when she was writing for Harlequin. Her books address current issues, exploring them, their impacts, and how to deal with them. Her characters are well developed and "real." I am looking forward to reading this series.